Nature, play and technology are the main subjects that I explore: each informs and challenges my intellect. I use them as devices for making art—as I did for my current installation Intertidal Grandeur in Artists of Hawai‘i 2017—and for understanding. Climbing in Utah with dad. I grew up in Utah, and much of my childhood was spent immersed in nature. 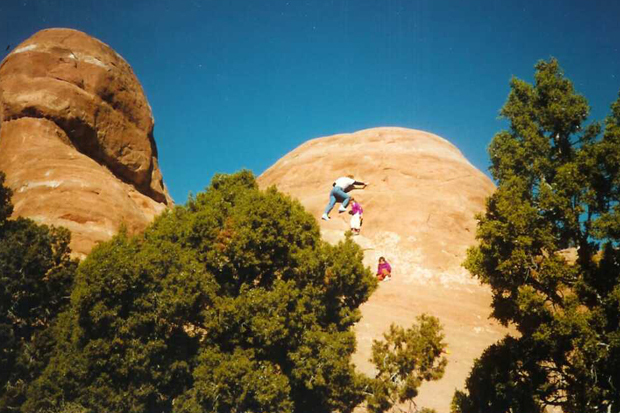 My father was always looking for new adventure spots—hot springs, hiking, biking and camping gems—so my love of the outdoors came at a very young age, and I was completely fascinated by the desert landscape. The rich red, brown and yellow sandstone mountains offset by the deep blue and purple skies were an intoxicating experience for me. I constantly think about the layers of color and texture that I observed, and these formal qualities are, inherent, in my art. This is my father’s mother, my grandmother, Norma. She was an accomplished artist in her own right. The artworks that had the most influential impact on me as a child were her landscape paintings. One day I walked into her studio as she was working on a painting. She set me up with a canvas and paints, put a paintbrush in my hand, and that was the beginning of my love for painting and art making. I am forever indebted to her for her love and support. In 2008, during my senior year as an undergraduate at the Ringling College of Art & Design, I started to make paintings that referenced organic shapes I experienced as a child in the southwestern landscape. I began to cut them up and rearranged them to suggest a landscape that is always in flux. I began to think about how important the outdoors have been to me, and how at peace I feel when engrossed by a body of water, narrow canyon or canopy of trees. As I got further along, my interest in human relationships with the earth and its history grew. I wanted to know more about how the earth has been used as a tool for growth and survival but, as a result, has been in a process of accelerated deterioration. The main subject I choose to deal with in my art is nature. This is incredibly problematic because nature is very difficult to define as its meaning shifts, depending on a persons experience, surroundings and culture. As suggested by Simon Schama in Landscape and Memory, “Landscape is the work of the mind. Its scenery is built up as much from strata of memory as from layers of Rock.” Schama goes on to say that one can’t deny that the various ecosystems sustaining life on the planet function independently of human agency. But it is also true that it is difficult to find a single natural system that has not, for better or worse, been substantially modified by human culture. My work has been an ongoing attempt to discover what “nature” I’m interested in, and why. This creates tension in the work—it begs the question: what exactly is natural and what isn’t? The beloved artist Mike Kelly believed that nature is a social construction, based on 19th-century ideals. He speaks of nature as something that is greater than “wilderness.” Wilderness is a key word here because it has been used to describe a nature that is untouched by man. This wilderness is one that many environmentalists have been fighting for because it is believed that “in wildness is the preservation of the world.” The presumption is that pure wilderness exists and, if preserved, would be the antidote for the poisons of industrial society. Throughout the history of painting, artists have dealt with the altered landscape as our culture has struggled to come to terms with a landscape that is changing dramatically and becoming increasingly modified by humans. For example, The Volcano School and Hudson River School painters were artists working around the time of the Industrial Revolution and much of their work was a response to a world that was rapidly changing during that period of time. These schools of painters created romantic depictions of landscape and the sublime to influence appreciation for untouched landscapes, as well as encourage the preservation of undeveloped landscapes. I, too, am exploring discussions of nature vs. culture; my work is also a response to rapid change in our contemporary human understanding of nature and landscape, as a result of the digital age. 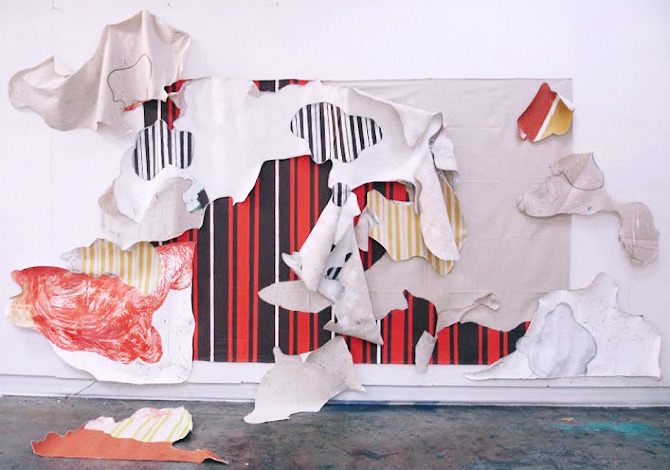 It wasn’t until I entered the Art & Art History Department’s MFA Program at the University of Connecticut, in 2008, that I was able to fully immerse myself in my interest in installation. 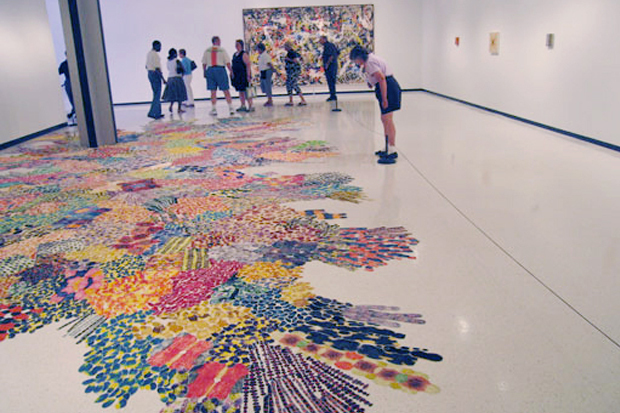 Polly Apfelbaum was a big influence for me during that time because I was interested in how she transforms a material, and the space in which it rests, simply by multiplication, and I was interested in her interpretation of a painting. Humor and the act of play function in several ways for me when creating a piece. I use them as a tool for thinking, learning, pleasure, freedom and a way of liberating myself from stress and trauma. Jean Baudrillard describes play as, “Wishing itself beyond labor but in its continuation, the sphere of play is always merely the esthetic sublimation of labor’s constraints.” Also, through the use of humor and play, I discover new formal, technical, and conceptual possibilities. An installation by Jessica Stockholder. I admire how Judy Pfaff is able to transform her materials, ranging from steel, fiberglass and plaster to salvaged signage and natural elements such as tree roots, into environments with explosive energy. 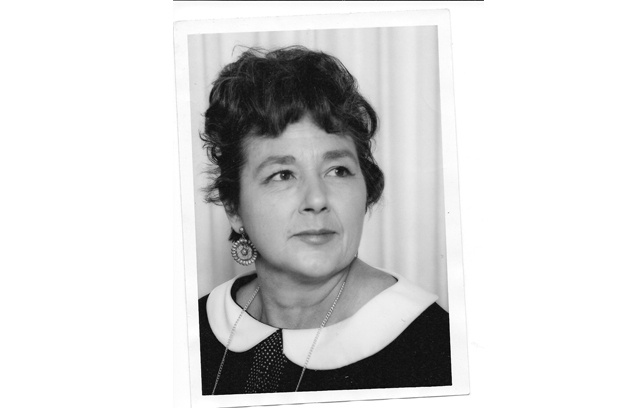 She was also a pioneer of installation art in the 1970s. As I continued to work with nature as a theme, I began to recognize the absurdity of our attempt to make up for our isolation from it with images of nature on our walls, carpets, furniture, etc. 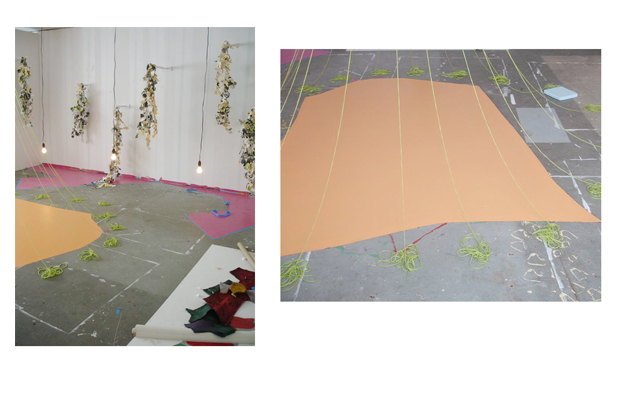 I created the installation Bloom (2009) with this in mind. My intent was to create a space that references the interior of a home desperately trying to re-create the experience of being outside. I gathered images from the Internet of floral textiles as well as wood grain prints found on faux wood walls and floors, and printed them on computer paper from an inkjet printer. I incorporated hanging light bulbs as an ambiguous stand-in for light from the sun. Each form references a manufactured object fashioned to suggest a non-manmade material: the chair legs as branches, cut-up paper as plants and hanging light cords and string as vines or banyan tree roots. Mephitic Pleasure (2009) was created by painting over, and responding to, the shapes of Bloom to generate a new environment and experience. One of my goals for this piece was to improve my use of vantage points so that the viewer would have something to look at in more than one direction. I engaged all areas of the room—from the four walls, to the floor and ceiling. During my graduate school years, from 2008 to 2010, I began to incorporate digital technology in my work as a means of artistic expression. As described by Nicolas Bourriaud, “For our age is nothing if not the age of the screen.” This description resonates for me because I grew up watching cartoons and playing video games on the television, I frequented the movie theater, and I witnessed the rapid progress of the computer and Internet. I distinctly remember the first time I used a dial-up connection to log on to AOL. The experience of being able to access information so quickly blew my mind and changed my perception of the world. With the click of a button I was immediately exposed to an experience and information that, previous to the advent of the internet, I wouldn’t have been able to access in such a short period of time. The world sped up before my eyes. The first project, in which I incorporated technology, was Cricket Glitch (2009). I read the New York Times article At Last, Artists Harness the Internet and it got me excited about technology playing a larger role in my art, since it plays such a dominant role in our culture. The article mentioned a form of art called Glitch Art that is described as “the exploitation of programming faults that cause a lapse in data transfer, leaving a pixilated effect known as a “residue” on the screen. It is essentially the aesthetization of a computer fault.” I decided to explore aspects of Glitch Art in my own work since I have long been interested in the element of chance in art, in the aesthetization of “fault,” and the joy in the element of surprise that chance brings. Also, Glitch artists use digital media as an intermediary to discuss code. I am using digital media as an intermediary to understand landscape, and by extension, nature. Since 2006, I have been creating what I like to call digital paintings. I took a number of those paintings and made them into an animation. 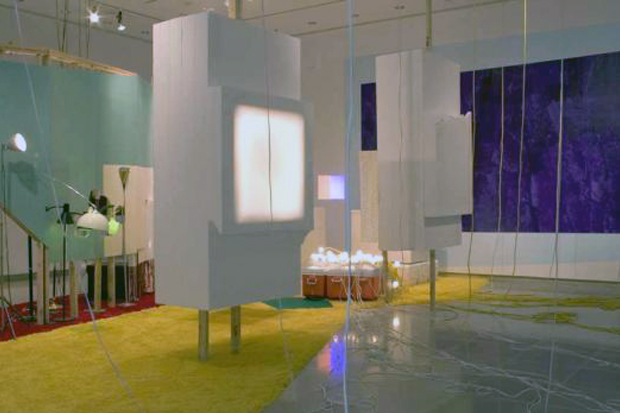 I projected the animation onto an installation made with carpet, light bulbs, and spray foam. The process I use to create digital paintings feels similar to painting with paint. However, instead of using paint I use computer software. I collect images from my personal background and manipulate them with computer software. Also, since my goal was to create an artificial environment that felt like the outdoors but was not, I decided to incorporate the sound of crickets and cars I recorded from YouTube. The end result was something that sounded part cricket and part mechanical. Digital Cumulus evolved out of Cricket Glitch. Working with the same theme of artificial landscape, I created a situation in which the whole space of the installation was engaged, much like Mephitic Pleasure, except this time I used projection and mirror to activate the space. I made another animation, and this time I was interested in creating a faux rainstorm with mesmerizing, colorful imagery. This was coupled with an occasional glitch in the sound and visuals. In its final presentation, each animation got progressively pixilated; referencing the technological side of our increasingly artificial landscape. 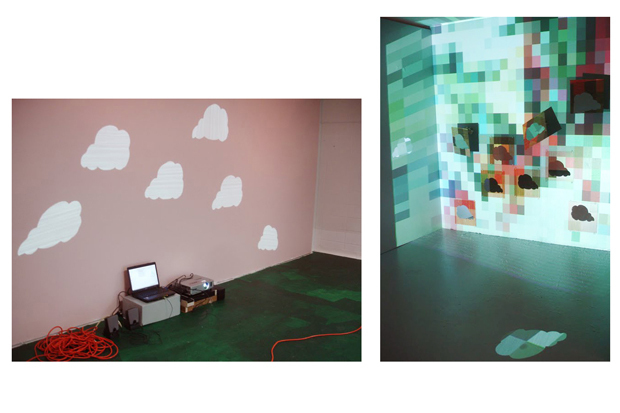 Digital Cumulus was also a response piece to three other things. First, an essay I read called “Technology Versus Nature: What is Natural?” by Holmes Rolston III. I was particularly interested in Rolston’s discussion of planetary engineering, in which he suggests that with proper funding the U.S. could have the ability to control and modify the weather. I found this idea fascinating, because it sounds so outrageous! But then I thought about what my dad does for a living—during the winter he makes snow. Second, in my reading about the effects of global warming and climate change on weather, I found interesting the predictions of stronger, more destructive storms in our future. Finally, I was inspired by the artist Cory Arcangel. He is a digital artist whose work is concerned with the relationship between technology and culture. I was particularly interested in how he referenced this relationship by creating artworks out of Nintendo games that he hacked into and manipulated. 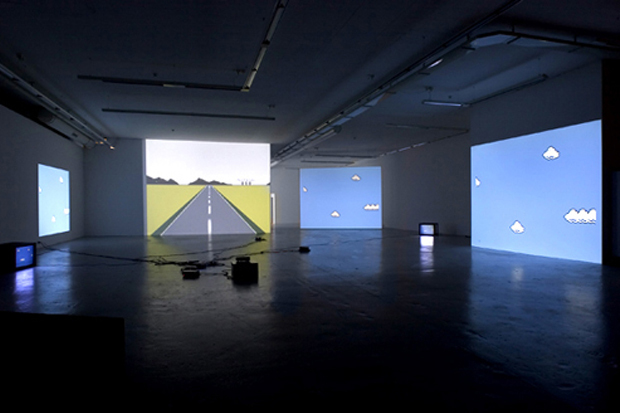 In 2002, Cory Arcangel created a piece titled Super Mario Clouds, in which he hacked into the Super Mario Brothers Nintendo game and erased everything except for the blue background and the clouds. 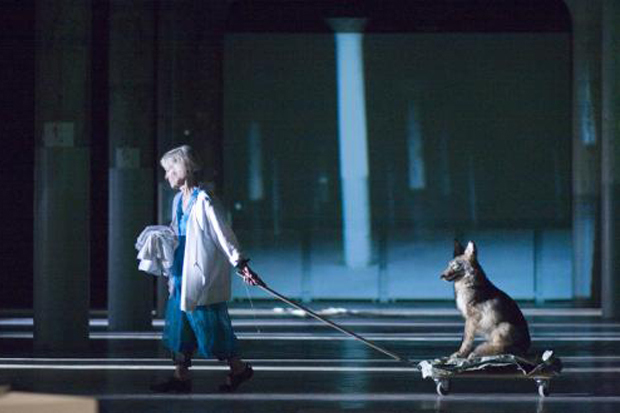 The artist Joan Jonas is my hero! I’m interested in her use of projection, color, and her free range of art mediums. In 2006, I was fortunate enough to experience one of Jonas’s performance video installations called The Shape, The Scent, The Feel of Things at Dia: Beacon. It completely changed my view of what art was, and is. She helped me see that one can use all manner of media simultaneously as a means of artistic expression and communication. I admire her so much and am grateful for artists, such as Jonas, who have challenged the limitations of art making by medium. Like Digital Cumulus, Pixel Park II (2010) has a similar theme. 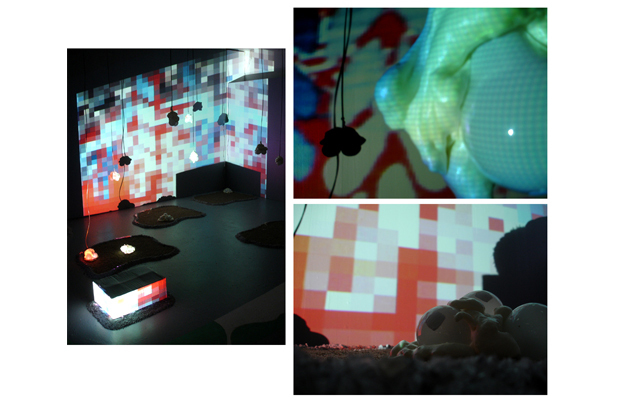 Pixel Park II is an animation installation that goes through a cyclical loop of creation, destruction and pixilation. Pixel Park II references the park setting as a highly groomed landscape. 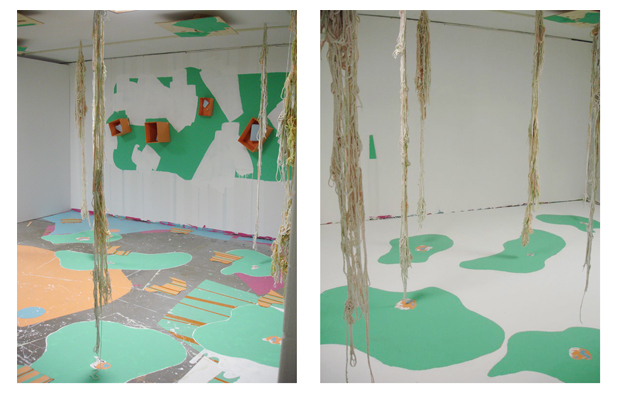 The viewer is greeted with materials such as AstroTurf, contact paper, and mirror along with the sound of birds chirping. Yet, the occasional computerized sound informs the viewer that the environment is controlled. Working with nature, play and technology as subject matter has been an exciting and challenging endeavor. Creating art will continue to be a way for me to understand and explore landscape and nature that is constantly evolving, changing, and becoming increasingly artificial. 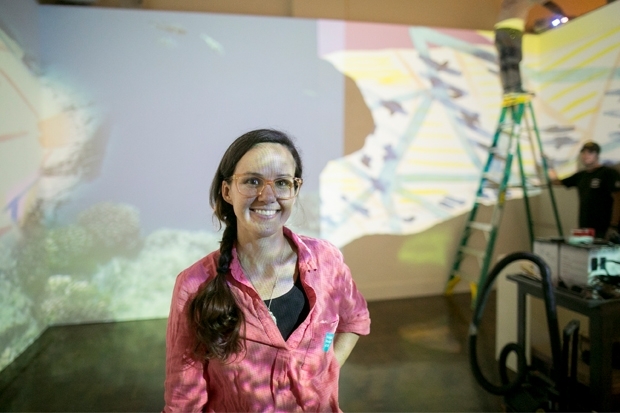 Kasey Lindley’s Intertidal Grandeur is on view in Artists of Hawai‘i 2017 through May 28. 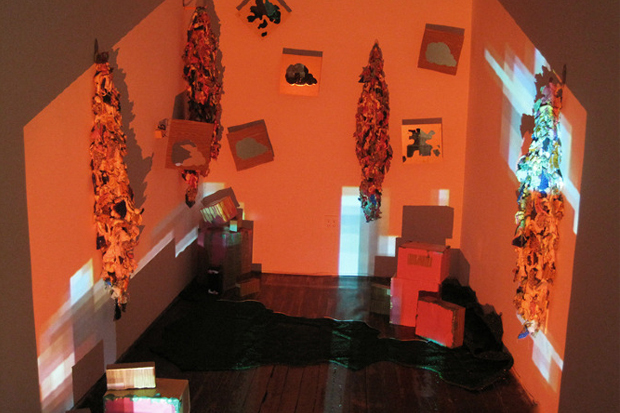 Read about how she created the installation. Your work is exciting, powerful and fascinating. So interesting how your love for nature influenced your work. I enjoyed learning how other artists and their writing affected your endeavors. Loved all the quotes. Great article.